Hotel Tentrem, owned by PT. Sido Muncul, combined lavish setting in a traditional atmosphere of Java. Located on the historical street near Tugu, the landmark of Yogyakarta, Hotel Tentrem is an oasis of tranquility immediately adjacent to the traditional ambience of the city of Yogyakarta. 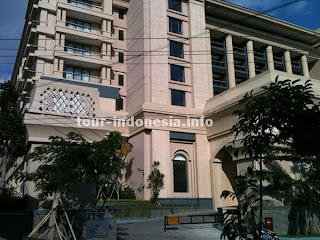 Hotel Tentrem is just minutes away from the well-known cut road of Jl. Malioboro, the street market. Designed by the most creative minds in the profession, every aspect of Hotel Tentrem emanates quite privilege which stands apart through the culture of Yogyakarta. Address: Jl. AM Sangaji No.72, Yogyakarta, Indonesia. The name "Tentrem" taken from Javanese language possesses a deeper meaning of Javanese value which is the feeling of peace and calm, also brings the whole concept of harmony between universe and human being, creating peaceful and serenity among them. This 5-star property has 276 rooms with up to 18.000m square size, Hotel Tentrem Yogyakarta towering buildings and majestic modern and traditional architecture, extraordinary luxury, which provide a special experience for your stay at Yogyakarta. 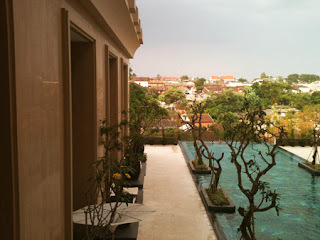 Hotel Tentrem Yogyakarta has six types of room to choose: 1. Presidential Suite 2. WijayaKusuma Suite 3. Kraton Suite 4. Execute 5. Premier 6. Deluxe. Presidential Suite is magnificent among the other five types of rooms, the price is the highest, and there is only one in the building. Presidential Suite has 273.8m square room including bedroom, dining room, working desk, private Jacuzzi and large balcony. Here you can get the most luxurious services of accommodation in Yogyakarta, together with free wifi, LED screen, satellite and IP TV, and private check in-out area. Kayu Manis Coffee Shop, The Grand Duck King Restaurant, and Eboni Bar & Lounge. Premier room sold at Rp. 2.500.000 per night, with two option, pool view or city view. Facilities: living room with a separate room. Deluxe room, which is smallest, with 40m square size was sold for Rp. 1.500.000/night. The Trans Luxury Hotel has the biggest convention center in Indonesia, with a capacity of 4,000 people, located on the 3rd floor and has direct access to the Trans Studio Mall. For meeting and banquet, Hotel Tentrem has 2100m square convention center, the largest in Yogya city. And 1872m square Ballroom with a capacity of 2,000 people.